Happy Holidays & A Book Giveaway! Happy holidays everyone! It’s time for another book promotion. 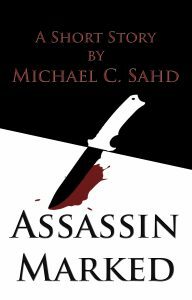 Today, you have the rare opportunity to download Assassin Marked for free. Be sure to grab yourself a copy to read while you have a bit of time off work next week. Speaking of time off (or the lack thereof), our house during the holidays has been a madhouse. Although many people make this claim about their households at this time of year, ours was especially hectic this year because we were unaware of our family’s main Christmas party until two days prior! To be frank, my wonderful wife was incredibly busy getting ready for it. She had planned to crochet bags to put presents in this year instead of wrapping them, so on top of cooking the cookies (and yes, the cookies were amazing), she was also crocheting up a storm. We ended up with many Christmas parties to attend during the weekend, which meant lots and lots of good food. I could have gorged myself, but I was good and didn’t. Ok, maybe a little. I did, however, have the opportunity to show off my awesome homemade pepper sauce. This sauce was very simple: peppers, garlic salt, and vinegar. But oh my god, it was good, and, unfortunately for some, also stupid hot. Yes, I used Carolina reapers to make it. I eat hot peppers all the time, so this is not that big a deal for me. Why reapers? some may ask. Well, the flavor is amazing. The reaper has one of the best pepper flavors. It is so good that my wife puts at least one of these tasty peppers in the salsa she makes, despite the heat. If you can handle hot, I highly recommend this pepper. How did your holidays go? Did you experience anything unexpected or unplanned while you were visiting family or opening gifts? Did you get (or give) anything awesome? If so, let me know in the comments below. That’s all for now.